queueing-1.2.6 has been released. This is a bug fix release; see the ChangeLog for details. 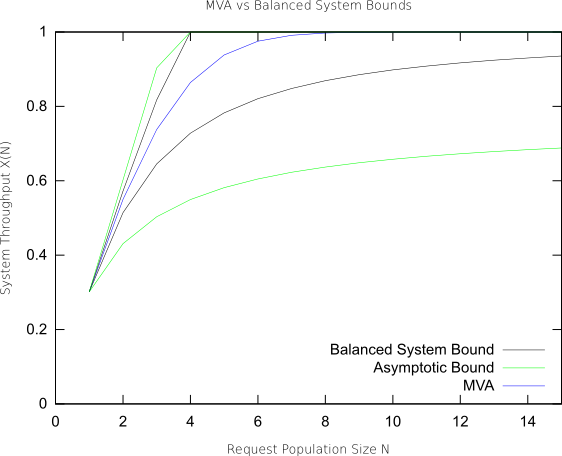 Exact asymptotic analysis of single or multi-class, product-form open Queueing Networks (Jackson networks or BCMP networks). Mean Value Analysis (MVA) for single or multi-class closed networks. Class switching is supported for multiclass closed networks. MVA for multiclass, mixed (open/closed) networks. Approximate MVA for closed, multi-class QN, using Bard-Schweitzer approximation. 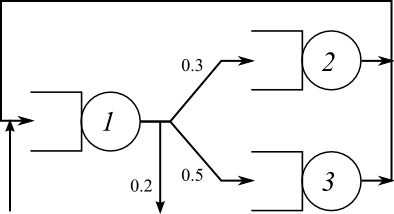 Convolution algorithm for closed, single-class product-form networks. MVABLO for closed, single-class QN with blocking. Various bounding techniques (asymptotic, balanced system and geometric bounds, among others). Transient and steady-state analysis of continuous and discrete-time Markov chains (e.g., computation of sojourn times, expected time to absorption, mean passage times, time-averaged sojourn times...). Steady-state analysis of the single-station queueing systems (M/M/1, M/M/m, M/M/∞, M/M/1/K and M/M/m/K finite-capacity systems, Asymmetric M/M/m, M/G/1, H/Hm/1). 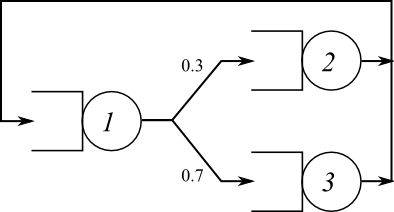 The queueing package requires some knowledge of queueing theory; furthermore, it (currently) does not include a GUI for interactively draw queueing networks. See the additional Resources below for a (non comprehensive) list of software packages for queueing networks analysis. The queueing package is under active development. New versions are released frequently. queueing is released WITHOUT ANY WARRANTY, see the file COPYING for details. I developed the queueing package to support my own research, and I am releasing it in the hope it can be useful to others. If you use the queueing package for teaching or research purposes, I would like to hear about your experience with it. Note that there is no binary distribution, as queueing is entirely implemented as Octave scripts; therefore, queueing should run on any system where GNU Octave has been ported. queueing is released under the GNU General Public License, version 3 or later. See the file COPYING for details; this file is also included in the software distribution. The command above can be put in the startup file (.octaverc on Linux) to automatically load queueing when Octave starts. Refer to the documentation for the list of functions provided by queueing. In this section we give some basic usage example for queueing. Refer to the documentation for more examples. By default, qncsvisits uses station 1 as the reference station; the reference station is used for two purposes: its throughput is considered the system throughput, and a job returning to the reference station is assumed to have completed one interaction with the system. It is possible to specify a different reference station, use the command help qncsvisits for details. where U is the vector of per-node utilizations, R is the vector of per-node response times, Q is the vector of average queue lengths and X is the vector of throughputs. Thus, the utilization of service center 1 is U(1)==0.99139, which is very close to 1.0. We can conclude that the service center 1 is the bottleneck device. Assume that the average service times are as in the previous example (S = [1 2 0.8]). Furthermore, assume an external arrival rate of 0.3 requests/s to center 1, and no external arrivals to other centers. In this demo we want to compute the bounds on the system throughput for the network in Fig. 3, which is very similar to the one of Fig. 1, with the only addition of an external think time. We are going to use the qnclosedab and qnclosedbsb functions, to compute the bounds on the system throughput for increasing values of the population size N, and compare the results with the exact throughput provided by the MVA algorithm. The result is shown in Fig. 4. Fig. 4: Balanced System Bounds and Asymptotic Bounds on the system throughput X(N) as a function of the population size N for the three-node, closed network in Fig. 3. Finally, starting from version 0.8.0 of queueing, there are a couple of functions which facilitate the definition and analysis of QN models. These functions are qnmknode and qnsolve. The first one is used to create appropriate data structures describing certain kind of QN nodes; the second one is used to analyze a model represented by those data structures. It should be observed that qnsolve (re)implements the same algorithms used by other functions such as qnopensingle, qnclosedsingle and so on; only the input parameters are different. The qnmknode function can be used to instantiate different kind of nodes (see the documentation for details). If can also be used to create multi-class nodes, or general load-dependent nodes, which can be analyzed with qnsolve. Again, see the documentation for details. Keep the documentation up-to-date; add missing chapters. Implement additional QN algorithms. Some references are G. Bolch, S. Greiner, H. de Meer, K. Trivedi, Queueing Networks and Markov Chains—Modeling and Performance Evaluation with Computer Science Applications , Wiley, 1998; L. Kleinrock, Queueing Systems Volume 1: Theory , Wiley-Interscience; 1 edition (January 2, 1975), ISBN 978-0471491101. Java Modelling Tools (JMT), developed by the Performance Evaluation Lab of the Politecnico di Milano, Italy. This software is very powerful and includes an easy to use GUI; being written in Java, it runs on many platforms. Furthermore, it can handle general (i.e., non product form) networks through simulation. Ian F. Akyildiz, Mean Value Analysis for Blocking Queueing Networks , IEEE Transactions on Software Engineering, vol. 14, n. 2, April 1988, pp. 418—428. Forest Baskett, K. Mani Chandy, Richard R. Muntz, and Fernando G. Palacios. 1975. Open, Closed, and Mixed Networks of Queues with Different Classes of Customers . J. ACM 22, 2 (April 1975), 248—260. Jeffrey P. Buzen, Computational algorithms for closed queueing networks with exponential servers . Commun. ACM 16, 9 (September 1973), 527-531. C. H. Hsieh and S. Lam, Two classes of performance bounds for closed queueing networks , PEVA, vol. 7, no. 1, pp. 3—30, 1987. M. Reiser and S. S. Lavenberg, Mean-Value Analysis of Closed Multichain Queuing Networks , Journal of the ACM, vol. 27, n. 2, April 1980, pp. 313—322. M. Reiser, H. Kobayashi, On The Convolution Algorithm for Separable Queueing Networks , In Proceedings of the 1976 ACM SIGMETRICS Conference on Computer Performance Modeling Measurement and Evaluation (Cambridge, Massachusetts, United States, March 29—31, 1976). SIGMETRICS '76. ACM, New York, NY, pp. 109—117. P. Schweitzer, Approximate Analysis of Multiclass Closed Networks of Queues , Proc. Int. Conf. on Stochastic Control and Optimization, jun 1979, pp. 25—29. Herb Schwetman, Implementing the Mean Value Algorithm for the Solution of Queueing Network Models , Technical Report CSD-TR-355, Department of Computer Sciences, Purdue University, 1982. 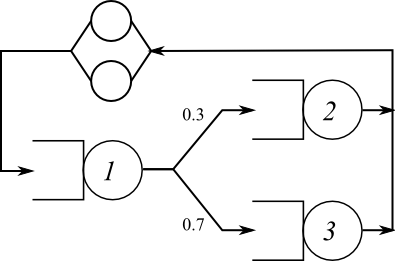 Herb Schwetman, Some Computational Aspects of Queueing Network Models , Technical Report CSD-TR-354, Department of Computer Sciences, Purdue University, 1981 (revised). Zahorjan, J. and Wong, E. The solution of separable queueing network models using mean value analysis . SIGMETRICS Perform. Eval. Rev. 10, 3 (Sep. 1981), 80—85.